A couple of weeks ago we got an intriguing kind of message. We get many interesting messages – some of them we print out and they become office memes – but what struck us about this message was that it came in not very long after we wrote about the importance of giving back. Jono told us about the XPRIZE Foundation, a non-profit that sponsors and manages large international competitions that bring about “radical breakthroughs for the benefit of humanity”. Their motto is, ‘Making the Impossible Possible’. Founded by Peter Diamandis, their board of trustees includes Elon Musk, James Cameron, Larry Page, and Arianna Huffington, amongst others. When Elon Musk comes calling…you keep reading. The latest competition, worth $15 million, is designed to eradicate illiteracy through the creation of Open Source software that will teach kids reading, writing, and arithmetic within 18 months. This will greatly benefit areas where little to no education exists. While XPRIZE provides the logistical support for product launch, it relies on all types of people to come up with solutions. The recently launched design drive encourages designers to create visual mock-ups of what the literacy software would look like. How will an illiterate boy or girl learn that A is the first letter in the alphabet? How will software on a tablet teach somebody to spell their name for the first time? It’s a powerful challenge. And design is where it all starts. Jono noticed we have a tool that encourages design collaborations. We also have a community of designers who build many awesome products using Moqups. While software engineers are going to build the product, it’s unlikely that many of the teams that form up will have the design skills to get their rocket software off the ground gracefully. This is why designers, and the design drive, are important to this challenge. It’s all about generating ideas and creating that perfect storm of creativity, know-how, and collaboration that leads to truly innovative solutions. Here’s what Jono has to say about it. If you’re a developer, scientist, teacher, writer, or a designer, you have the opportunity to participate, just by providing feedback and ideas. You also have an opportunity to form a team with people who are passionate about making a difference in the world, the way these people did. Given the technology that exists and the tools at our disposal these days, this is a clear cut chance to make the world a better place. Go to forum.xprize.org to start sharing your design ideas! Countless startups are built with open source projects. 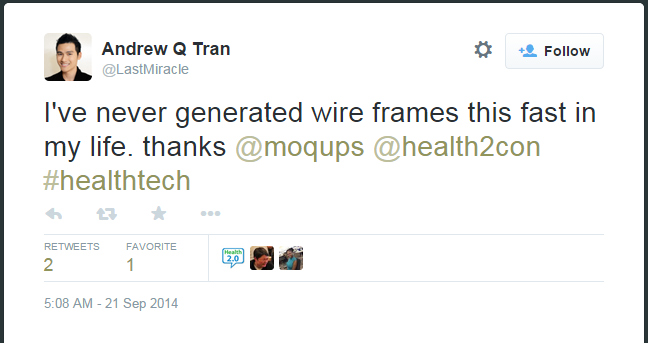 Moqups, built entirely on open source technologies, is just one example. The hours that developers the world over have put into these technologies simplified our lives and saved us from reinventing the wheel. Because we owe our existence to the open source community, we wanted to give back in our own way. So we created the non-profit plan for all non-profits, educational organizations, and members of open-source projects. Initially it was just the open source community that came to mind, but then we decided to experiment with educational institutions and non-profits. The reasoning behind the decision was simple; one of our core beliefs is that software should be easily available to those who need it most but can’t always afford it. To date, we’ve had over nearly one hundred universities sign up and, along with them, entire classes of students. It was amazing to hear from a professor of Hong Kong’s PolyU, considered one of the world’s top Design schools, who wanted to use Moqups for his ‘Information Architecture and Visualisation’ course. Talk about validation. But it’s not entirely surprising. Moqups has almost no learning curve, anyone can use it. Instead of spending valuable teaching time on learning a tool, the course director and students can get right into the course material. We’ve also had numerous NGOs and non-profit organizations reach out. Among these we count Mozilla and Khan Academy. Giving back to the community is not the whole story though. It’s an important reason, to be sure, but there’s also the simple fact that many entrepreneurs need to count the pennies when they’re starting up. We get it, investing in growth and infrastructure is probably more vital to your product than design and creativity tools for which workarounds exist. This is especially true for schools or NGOs whose options are limited given the lengths they need to go through to justify spending. And of course, there are the starving students, and we’ve all been there, so helping them out is a no-brainer. To be honest, we never thought the non-profit package would be so successful. For some odd reason, we figured that only a few organizations would take us up on the offer, but we’re blown away by the response. Every time the new school year rolls around we’re swamped with requests from places like MIT, Berkley, Stanford, or Carnegie Mellon. As an aside, we also never thought we’d reach remote places like Greenland where the local government is using Moqups to wireframe a new citizen portal, but that’s another story. You get constant feedback and validation for your product. It’s an excellent source of motivation during the ‘bad old days’ most startups experience at one point or another. That feeling when your product is truly helping people solve their problems is priceless. In the technology sector, where we’re always using open source tools, the sharing economy manifests itself daily. It helps grow new companies and build great products. So giving back puts us at the heart of the revolution. 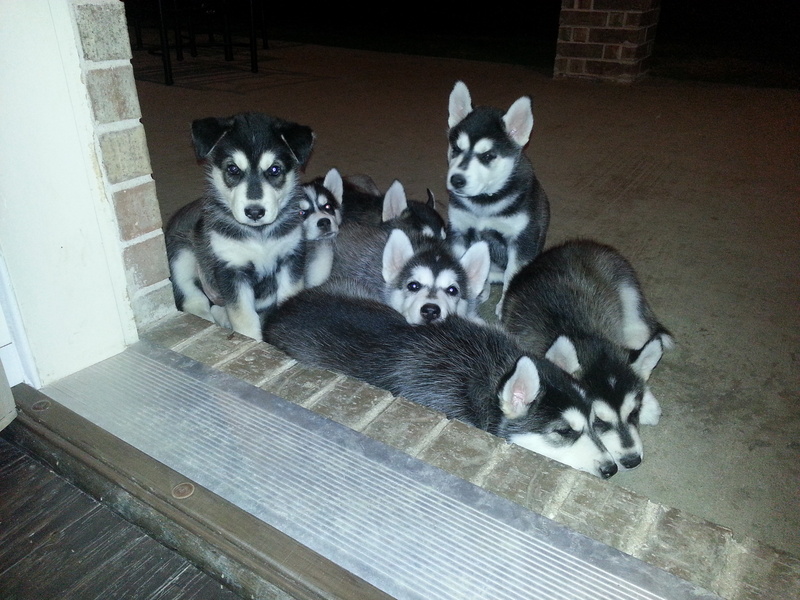 But if all these are not compelling enough reasons, there are about eight more furry ones below. 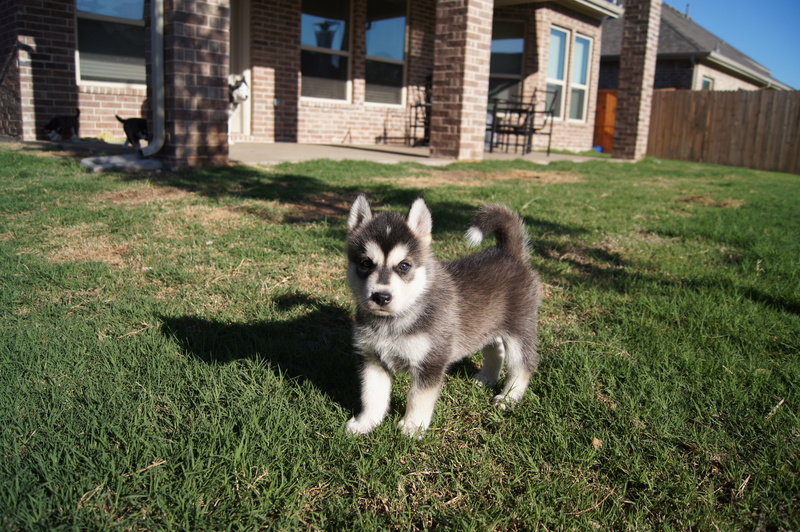 When Texas Husky Rescue contacted us because they wanted to use Moqups to design their new site, they bribed us with several images that kinda made our day. At first, it was the need to get the product out the door that trumped marketing considerations. But here we are two years later with a mature product, super users, and still no landing page. 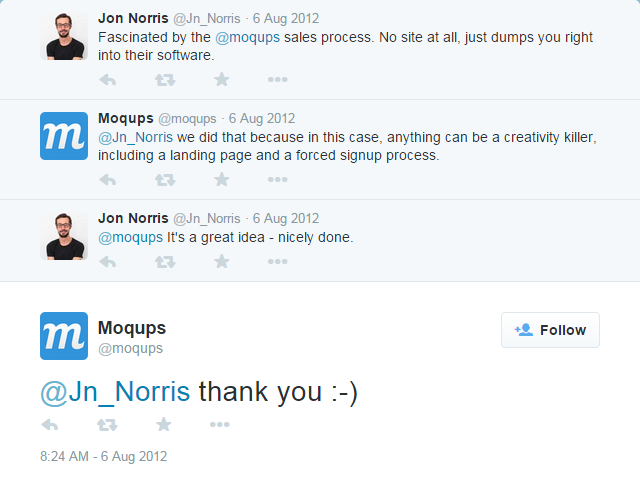 In a world of conversion optimization, the Moqups homepage is something of a paradox. One of our early users was fascinated by the whole thing. A landing page would be nothing short of a creativity killer for new users. It might lead to a few extra sales, true, but we’d be compromising one of core principles; creativity and design go hand in hand. Moqups is a tool that enhances a distinctive creative process. Period. Picture yourself in the perfect storm of a lightbulb moment and the right place to act upon it. It doesn’t happen often, but when it does, how do you like hitting a five-step funnel that ends with a credit card form? Do you still remember exactly what you saw in your mind’s eye when the inspiration hit? Is the creative spark just as bright as it was when you ‘landed’? The truth is any authoring app disparages its own value proposition when usability is taken over by sales and marketing considerations (the guys at Hemmingway know that). It also disrespects the idea person, or, as Google calls them, the Smart Creatives. We don’t think that they need a conversion funnel to pay for a good product. Nor does anyone need much convincing once they have an idea. Then there’s the technology angle. HTML5 implies instant gratification. But if you throw the common growth hacking techniques on top of an HTML5 app you’ve broken that promise. In our Internet world of forgotten passwords, attention grabbing (but ultimately disappointing) headlines, and ubiquitous advertising, there’s no greater satisfaction than hitting a page and getting what was promised. By foregoing the prospect of more sales delivered by a marketing driven landing page, we’re giving our users an experience that they appreciate. Finally, some of us have ADD, and conversion funnels are guaranteed to kill our temporary mojo. Conventional wisdom dictates that Landing Pages are the holy grail of growth, but that simply isn’t the case with every app. We want everybody who hits Moqups to keep that creative spark alive and bright. Does this mean we will never, ever, ever have a landing page? No, it just means that whatever happens, we’ll always optimize for creativity.